Egyptian President Abdel Fattah al-Sisi headed to Germany’s capital of Berlin on Sunday to attend a mini-summit of African leaders, heads of states and governments and members of the German Initiative for Partnership with Africa, under the G20 Africa Partnership called on by German Chancellor Angela Merkel. Egypt’s ambassador to Germany, Badr Abdel-Ati said that President’s visit to Germany comes as part of Egypt’s participation within the second mini-summit. He added that Sisi will hold bilateral meetings in particular with a number of German officials. Abdel-Ati said that the president is the only one of the African leaders participating in the summit who has been invited by Merkle for lunch to discuss Egyptian-German bilateral relations and some regional and international issues. 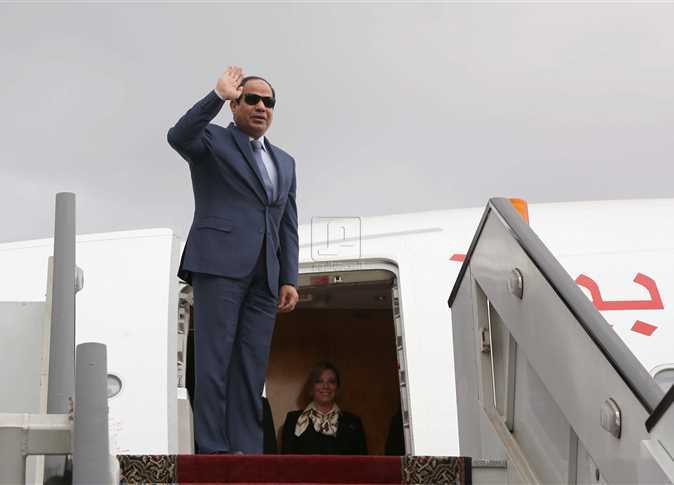 He added that Sisi is the only one of the summit attendees who will visit the historic headquarters of the Bundestag, where he will hold bilateral talks with the Bundestag chairman and meet with the German president at the presidential residence. Sisi will meet with a number of German ministers including the foreign, interior and economy ministers. He will also hold a round table with a distinguished group of heads of German companies interested in investing in Egypt to discuss investments. On Saturday, Sisi received a delegation from the Bundestag headed by Peter Ramsauer, Chairman of the German Parliament’s Economic and Development Cooperation Committee.